Jonathan Beattie Carpenter was born to Cynthia and James Hines Carpenter in 1838 in Rutherford County, North Carolina. James Carpenter was a successful merchant, owning $1,000 in property in 1850, which grew to over $7,000 by 1860. And yet, the Carpenter family owned no slaves. From the beginning, Jonathan Beattie Carpenter, or J. B. Carpenter as he signed his name, was the product of his environment. Slaves were present in Rutherford County, but even many of the wealthiest in the county did not own them. It is unknown why most of Rutherford County, and in fact much of this area of North and South Carolina, decided to forgo a paid laborer, but what is know is that J. B. Carpenter continued to follow the overall feelings of the county by supporting the Confederate States of America, and then becoming a Republican after the Civil War, and was the founder and co-editor of a â€œconservativeâ€ newspaper, The Rutherford Star. There being no known personal manuscripts of J. B. Carpenter, the only way to know his feelings regarding the Civil War is by his voting record while serving in the North Carolina House of Commons between 1862 and 1864. He tended to vote for a small government, voting to maintain the writ of Habaus Corpus and to encourage North Carolina Senators and Representatives of the Confederate States of America to abolish the law allowing the President to suspend the writ. He was also a supporter of the war as late as 1864, voting for the substitution of words in a bill giving ultimate power of peace negotiations to the Confederate States of America, but supporting continuation of the war if the Union would not recognize the Confederate States of America as a sovereign nation. He also served as a soldier briefly during the war, but was discharged in October of 1861 due to disability after contracting measles. After serving in the North Carolina House of Commons, he served as Postmaster at Butler in his home Rutherford County. His amnesty letter was written on August 15, 1865. In it, he applied under the first clause, having served as a Postmaster for the Confederate States of America. J. B. Carpenterâ€™s preference for the Republican Party was further shown during the growth of the Ku Klux Klan. By 1869, the Klan had grown in nearby Cleveland County, as well as in Spartenburg County, South Carolina. But in Rutherford County, J. B. Carpenter and the Logans were not the only Republicans. It was feared in 1871 that Rutherford County would suffer more from Klan violence because their Republican majority was so large. Aside from publishing The Star, J. B. Carpenter also turned to the state and federal government for assistance in fighting the KKK. He wrote to the Governor and the President for assistance, and traveled to Washington, DC to testify against the KKK. In fact, leaders of the Cleveland County KKK expressed a desire to kill J. B. Carpenter and others in order to continue the KKK. From birth, it is apparent that J. B. Carpenter followed the general beliefs of those in his county. His family did not own slaves, but few in the area did no matter their wealth. J. B. Carpenterâ€™s voting record while serving in the North Carolina House of Commons often followed that of the majority, including supporting the war effort to the bitter end. By 1866 he was beginning to lean toward the Republican Party, supporting President Johnsonâ€™s plan for Reconstruction in his newspaper, and even printing an editorial encouraging the education of African Americans. A statement by a neighbor shows that J. B. Carpenter and the Logan family were not alone in their Republican preferences. In 1869, it was feared that the strong Republican majority would lead to an increase in Ku Klux Klan violence in Rutherford County. But J. B. Carpenter appears to have become a leader in the fight against the KKK. Carpenter was a strong leader. From serving the Confederate States of America to defending the Union after the war, he helped lead a secluded section of the country through the shadows of rebellion to the reconstruction of the Union. J. B. Carpenter, Amnesty Petition, August 15, 1865, Case Files of Applications from Former Confederates for Presidential Pardons ("Amnesty Papers"), 1865-1867, Records of the Adjutant General's Office, 1780s-1917, Record Group 94, Publication M1003, National Archives, Washington, D. C.
The petition of J. B. Carpenter a resident of the County and State aforesaid, aged twenty seven years, last June and by occupation a Farmer represents unto your Excellency that in the Beginning of the late rebellion he was an original Union Man and during the Continuance of the same his political opinions underwent no change. He entered the service of the Confederate States as a volunteer in June 1861 and was relieved from the same in October following. [H]e was elected to the Legislature of No Ca in 1862 and served for two years as a member of that body, he purchased and sold to the soldiers articles of necessity frequently during the continuance of the rebellion. [H]is general conduct was quiet and orderly. Your petitioner was Post Master at â€œButlerâ€ in said County under the so called Confederate States. The offense chargeable against your petitioner is contained in the first clause of the amnesty Proclamation of 29th May 1865. Your Petition desires to be pardoned and to be placed on a footing with loyal citizens of the United States, as in duty bound will every pray. Sworn to and subscribed this 15th Augt. 1865. Carpenter, Robert C. Carpenters A Plenty. Gateway Press, 1982. Cole, Timothy. The Forest City Lynching of 1900: Populism, Racism, and White Supremacy in Rutherford County, North Carolina. McFarland, 2003 (123). Journal of the House of Commons of North-Carolina at its Adjourned Session 1862-’63. Raleigh: W.W. Holden, Printer to the State, 1863. Wednesday, January 28, 1863, 197-8. Journal of the House of Commons of North-Carolina at its Adjourned Session 1864. Raleigh: W.W. Holden, Printer to the State, 1864. Tuesday, May 24, 1864, 41; Thursday, May 26, 1864, 52-55; Saturday, May 28, 1864, 66-67. Prospectus. The Rutherford Star. V. 1, no. 1, May 2, 1866. General Assembly Session Record November-December 1862 Certificate of Election House of Commons, Joseph Bailey Carpenter, Rutherford County, North Carolina. J.B. Carpenter, First Corporal, Company G, 16th Regiment Confederate States of America. Pension Application, July 7, 1925. North Carolina State Archives, Raleigh, North Carolina. Military Collection, Civil War Collection, Petitions for Pardon, Box 6.2, Folder Carpenter, J. B.
U.S. Census, 1850: Heads of Families. Washington: Government Printing Office. U.S. Census, 1860: Heads of Families. Washington: Government Printing Office. It is important to note that the North Carolina State Archives has Jonathan Beattie Carpenter listed as Joseph Bailey Carpenter. 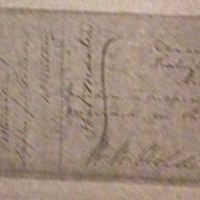 Two signatures were compared, and archivists at the North Carolina State Archives as well as Genealogist Robert C. Carpenter all concur the two signatures belong to the same person. The first signature was in the will of James Hines Carpenter, in which Jonathan Beattie Carpenter is mentioned, and J. B. Carpenter signs. The second is the Will of J. B. Carpenter, which the North Carolina State Archives has listed as Joseph Bailey Carpenter. It is believed that somewhere the name was mistranscribed, also it is unknown where this mistranscription occurred. Both men also have the same birth year, same date of death, and resided in the same county. It is also important to note that I have gone by the spelling of Jonathan Beattie Carpenter in James Hines Carpenters will. It is spelled differently in in Carpenter appear to be the same. Carris, C. S., Amnesty Petition of J. B. Carpenter, August 15, 1865, Civil War Era NC, accessed April 24, 2019, https://cwnc.omeka.chass.ncsu.edu/items/show/868.